One month ago, Animals Asia rescued five moon bears from at least 13 years of cruelty on a Vietnamese bear bile farm. All that time they had been trapped in small metal cages completely devoid of any stimulation or natural objects. Carers were most shocked by the awful condition of the bears’ teeth, but can now rest easily after a visit from renowned dental specialist Dr Cedric Tutt. 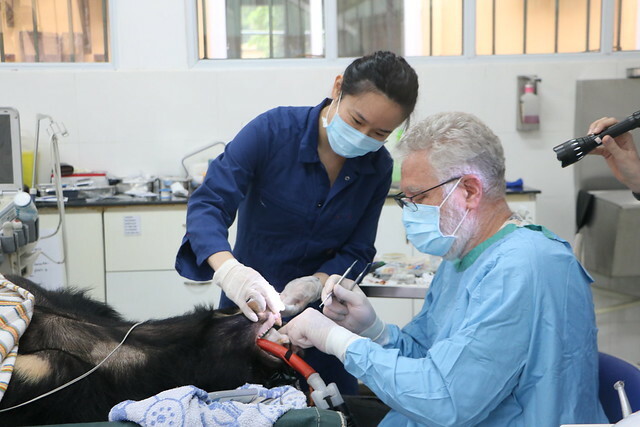 Moon bears LeBON, Mekong and Star are now pain-free after the completion of complicated dental procedures. All three bears received root canal surgery to remove severely diseased internal pulp cavity from three of their canine teeth. This procedure allows Mekong, Star and LeBON to keep their pivotal canine teeth, while removing the agonising pain they have long been forced to endure. 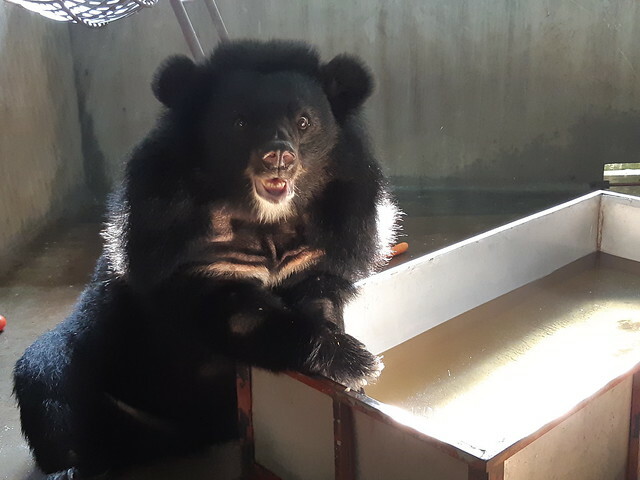 While the surgery marks a turning point in the bears’ physical recovery, their psychological rehabilitation has moved to the next stage with the bears enjoying an early move to indoor dens in the sanctuary’s River House. Here the bears can continue their quarantine period in large spaces filled with enrichment structures such as splash pools and multi-level climbing frames which will stimulate body and mind. While the bears aren’t yet physically or mentally ready to go outside, carers brought the outside to them in the form of lumps of earth and grass to help re-acquaint them with the natural world. “All five bears have been absolutely delighted with their move to River House. Moon bear Kim went straight for the pool, even before the water was in! Once full, that is where she spent most of her afternoon. “Mekong had the zoomies! He ran around everywhere, climbing up to the roof, baskets and platforms, checking out the view, and kicking a plastic ball around. “Mai meandered around, sitting up to sniff the air. She also loved her pool and submerged her whole tiny body in it. Since the move to dens, carers believe all five bears are showing signs of reduced stress. In the coming months they will be introduced to other bears and, when they are ready, will be able to explore large, outdoor enclosures. A gift from you today could help support the long-term care and rehabilitation facing Kim, Mekong, LeBON, Mai, and Star. Could you help mend these brave bears?